Love it or loath it, there’s more to Walsingham than the shrine! Never mind summer’s high church high jinks! I recommend Walsingham’s wet winter woods in February. The Presentation of Christ in the Temple, some call it the Purification of the Blessed Virgin Mary or Candlemas falls on 2nd. Forty days after Jesus’ birth Mary, Joseph had taken their new baby on pilgrimage. At the temple in Jerusalem the infant Christ was recognised by the elderly Simeon and Anna who spoke to his parents about their child and his destiny. 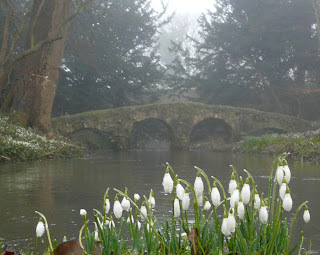 One misty February morning found me on pilgrimage in Walsingham. I had parked at the Slipper Chapel, then walked the Holy Mile to the Abbey - avoiding the traffic on the main road by following the new path along the old railway line.